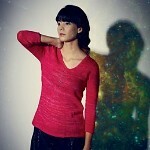 I first met Audry Nicklin at the Local Designers Night at Nine Rubies almost two years ago now. A self-described aspiring designer at the time, she talked about her goals and asked if I had any advice regarding the industry. At the time I was struck by her drive and also how sweet she was. 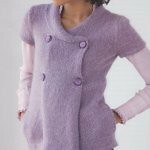 She gave me her card and, when I got home that night, I checked out her designs -- fun, adorable knits, all with a great sense of whimsy. Soon after our meeting, she burst onto "the scene" with her brilliant and stunning Celestarium, a circular shawl that maps out the night sky as seen from the North Pole, then followed up with the equally beautiful Southern Skies. 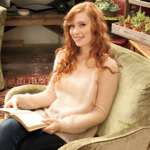 And now, this talented designer is about to publish her first book. All photos copyright Audry Nicklin. Lit Knits is a collection of 10 patterns inspired by classic works of literature such as The Secret Garden, Anne of Green Gables, Alice's Adventures in Wonderland, and more. 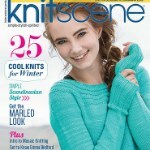 There is a great range of projects, from mitts to a shawl to a hat to the cabled men's sweater seen on the cover. And Audry includes perfectly concise notes on blocking, how to choose size, and how to handle differences in gauge. The photography is beautiful and the props (including horses!) absolutely perfect to set the scene for Audry's designs. True to Audry's design aesthetic, the pieces are whimsical and true to the books that inspired them, without being costumey at all. And her attention to detail is fantastic -- even the cable patterns have been given inspired names! ...and a pocketwatch on one of the palms! 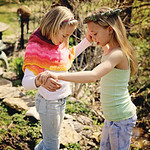 Brinker, inspired by Hans Brinker or The Silver Skates by Mary Mapes Dodge. 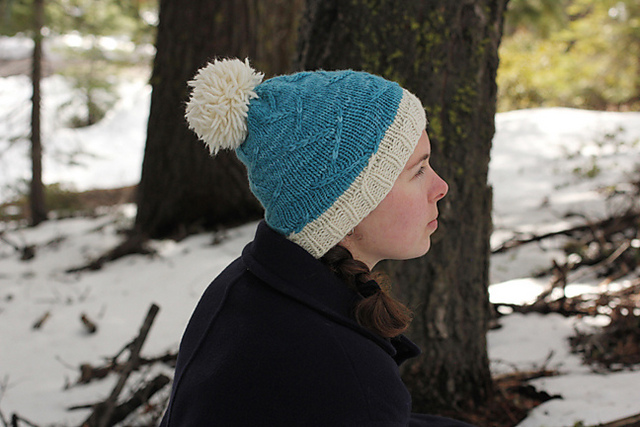 I love the shaggy pom pom and the simple and clever "Skaters to your Marks" cable pattern. Sail to Treasure Island, inspired by the book by Robert Louis Stevenson. It looks like just an awesome blanket...but in true Audry fashion, the cable pattern is actually a map of Treasure Island. 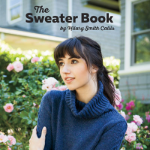 And, if you'd like to enter to win a free copy of the e-book, Audry has generously offered to send it off to one lucky reader of The Yarniad! As usual, leave me a comment here letting me know which design from Lit Knits is your favorite any time before 11:59pm next Friday (the 20th). 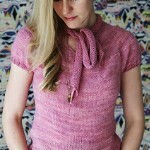 Please also include a way to get ahold of you should you win (Ravelry ID, email address, blog URL, etc.). I'll wake up and promptly draw a winner next Saturday morning. Good luck! 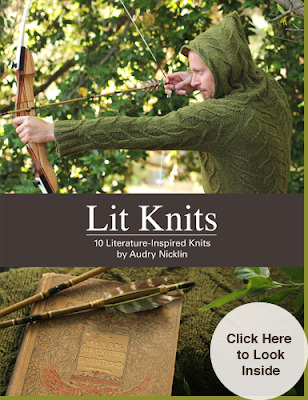 To see more about Lit Knits, check it out on Audry's website, here, or on Ravelry here. I love Robin Hoodie, great sweater! Maybe that Treasure Island blanket. That's really beautiful. I love the Behind the Garden Wall socks; especially the wee key on the sole. The Robin Hoodie makes my fingers twitch. Looking for the perfect green yarn. The Robin Hoodie is my favorite. I actually thought "Faramir" when I first saw it too. I really love Behind the Garden Wall. Those ivy leaves are just right! In case I win, I'm LoonyNuna on Ravelry. The bunny mittens slay me! 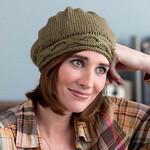 I'm meredithwood on Ravelry. I must have the Robin Hoodie. I've been wanting to knit myself a hoodie for quite a while, but all the men's patterns are too bland. The cables on this are wonderful! Thanks for a wonderful giveaway. 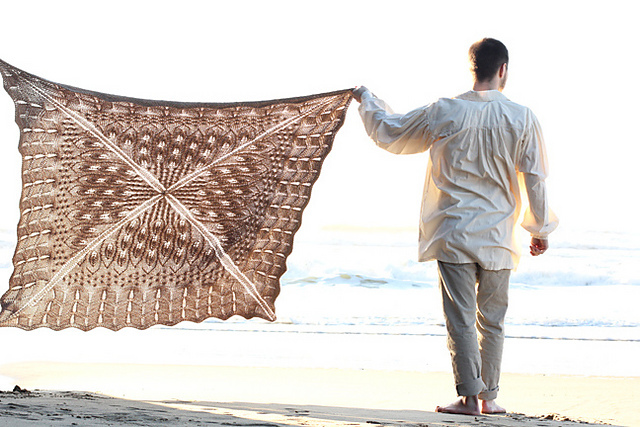 Ohhh I would love to knit that Treasure Island shawl! Lovely! I'd jump on the robin hoodie. thanks! Such whimsical designs, but the standout knit for me are the Behind The Garden Wall socks. The key is such a great idea! I love the Robin Hoodie. It's gorgeous! I'm in love with the rabbit mittens. And the watch! Too dear. I like Avonlea and the Wanderer cowl. Pick me, please--and thanks for sharing! I absolutely love the Down the Rabbit Hole mittens. Those would be the best to keep me warm during cold Upper Michigan winters, and fun for musing on long walks in the snow. What a great idea for a book! I love the Sail to Treasure blanket...so clever! It's a beautiful book indeed, & the one that really stood out to me is the Sail To Treasure Blanket....that would be a great addition to any couch!!! I would love to make the Robin Hoodie, but I think the first thing that I would have to cast on would be the Behind the Garden Wall socks. 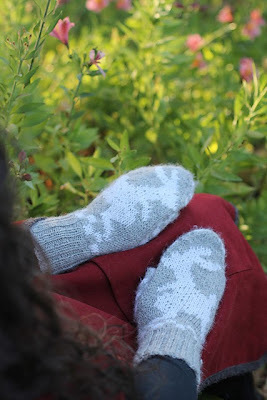 The Secret Garden was my favorite story as a child, and those socks are a perfect interpretation of the story. I love Avonlea as much as I've always loved Anne. Thank you for hosting. 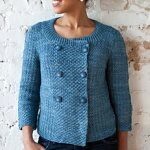 I'm bigblueice on Ravelry. The robin hoodie. It's just so unique. I love the Treasure Island! But Robin Hoodie and Deep Sea Wanderer are also calling my name! Robin Hoodie and Treasure Island, but my favorite has to be Avonlea since I'm a huge Anne of Green Gables fan! Sail to Treasure Island is my favorite. Brinker is a wonderful hat. I love the story it tells. Not the popular favourite, I expect, but the one I want to cast on most is Behind the Garden Wall. I love those socks. 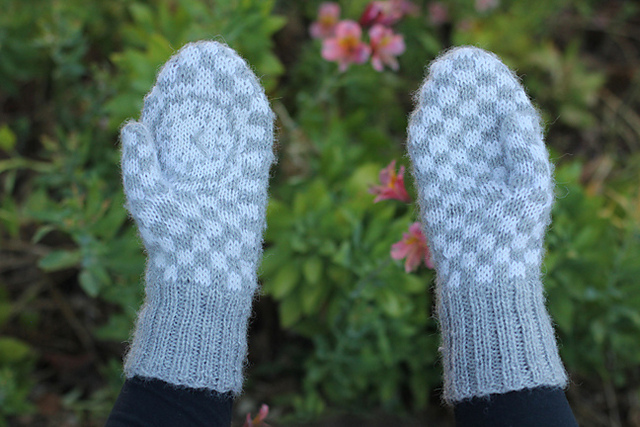 The Down the Rabbit Hole mittens are so cute! Ooo, Sail to Treasure Island looks gorgeous. Ravelry ID is rkohlman. Thanks for the chance to win. 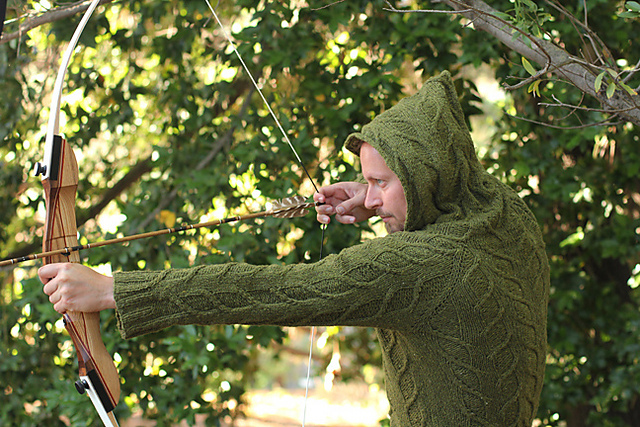 My favorite is the Robin Hoodie, but all the other patterns are beautiful too. I love the Behind The Garden Wall socks—the key detail is so perfect! Robin hoodie is hands down my favourite. Motor Madness in honor of Mr. Toad and all the books we have read through school so far... and future adventures. I love the Robin Hoodie, but am probably more likely to actually knit the Behind the Garden Wall socks. 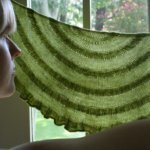 I love the Avonlea shawl! I love these stories! I can't decide between Avonlea and Behind the Garden Wall! Wow! Behind the garden wall socks - love love love socks! 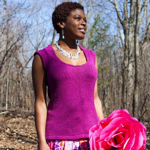 I love the Anne of Green Gables shawl and the Secret Garden socks, that key on the bottom slays me!